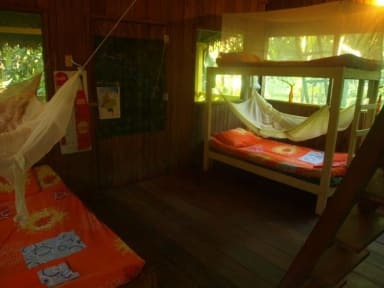 Nestled in the 2Ha of jungle that are the land of Omshanty Jungle Lodge you will find 5 comfortable and rustic and romantic cabins where we offer our lodging services; independent, separated and surrounded by nature. Omshanty Jungle Lodge also offer ‘rent a bike’ and a huge variety of activities and multiday tours, excursions and survivor adventures to enjoy the Jungle the most. 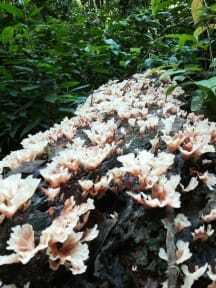 Your best ' base camp 'to explore the jungle in depth without losing the comfort and communications (public buses stop at the main gate of Omshanty Jungle Lodge every 25min, also CLARO cellphone sign is available in the area). In Omshanty Jungle Lodge find a place to relax and enjoy nature at its best. Nestled jungle Uitotos our indigenous neighbors, with the ones we work directly (80% of our staff is indigenous) and the forest itself will make you get more interested and want to further explore this natural paradise. Our restaurant 'Salama', open in April 2017, give you a wide range of menus and dishes: daily menu, executive menu, latin cook, local indigenous dishes, vegetarian and vegan as well as some organic & semi-organic food will delight your palate.